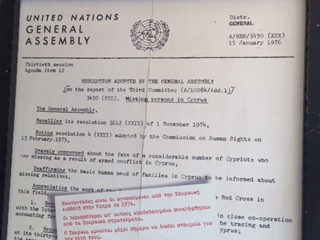 We arrived in Limassol, the main port of Cyprus, around 12 noon today and left on our excursion to Khirokitia and Nicosia at 12:15. 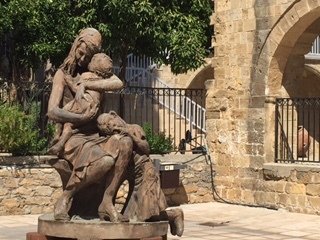 It is very hot here and reached 100 in Nicosia. 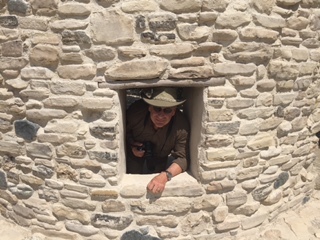 What would you expect from a guide in Cyprus? 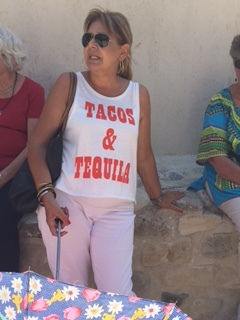 A shirt about tacos and tequila! 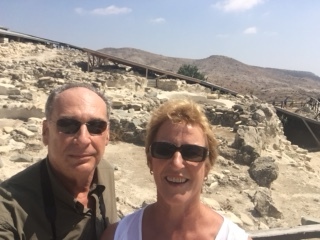 First we went to the archaeological site of Khirokitia, which dates back to 7000 BC. 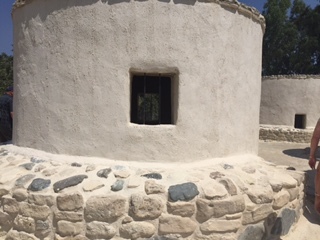 First we saw reconstructed round buildings that were the living quarters back then. Norm had to have a look inside! Back in the day, they even buried their dead, sometimes with grave-goods, in pits inside the units which continued to be inhabited so that the dead remained with the living and death would not break the community cohesion. The first cemeteries were probably established around 1600. 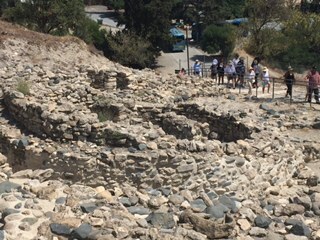 Then it was a long climb up to the top where the ruins of the original buildings could be seen. Interesting place, included on the UNESCO World Heritage list. 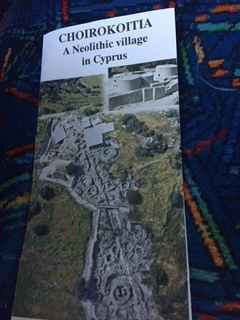 It is the earliest known culture in Cyprus and indicates that a well organized and developed society resided here. Note that they spell things many different ways here! 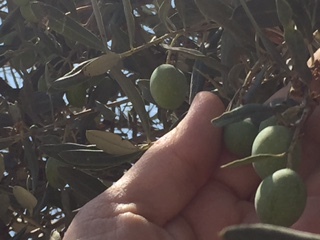 We saw lots of olive trees and also carob trees, here are some pictures of the carob and the olives. Carob trees are protected by the government and there are over 2 million trees. 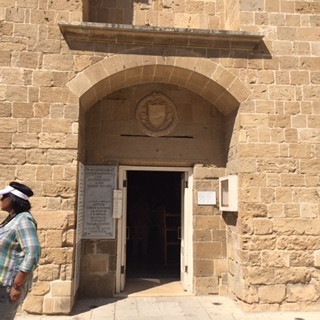 We then traveled to the center of the island, to Nicosia. It has the distinction of being the last divided capital city in the world after the fall of the Berlin Wall. Dividing north and south is the Green Line which runs directly through the city. 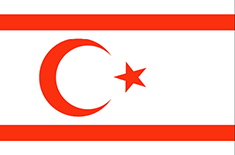 The northern side (36.2%) has been occupied by Turkey since July 1974 and the southern side by Greece. 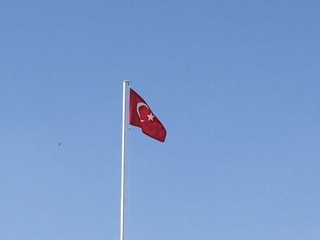 Our guide doesn’t call it the Turkish area, she calls it the occupied area. 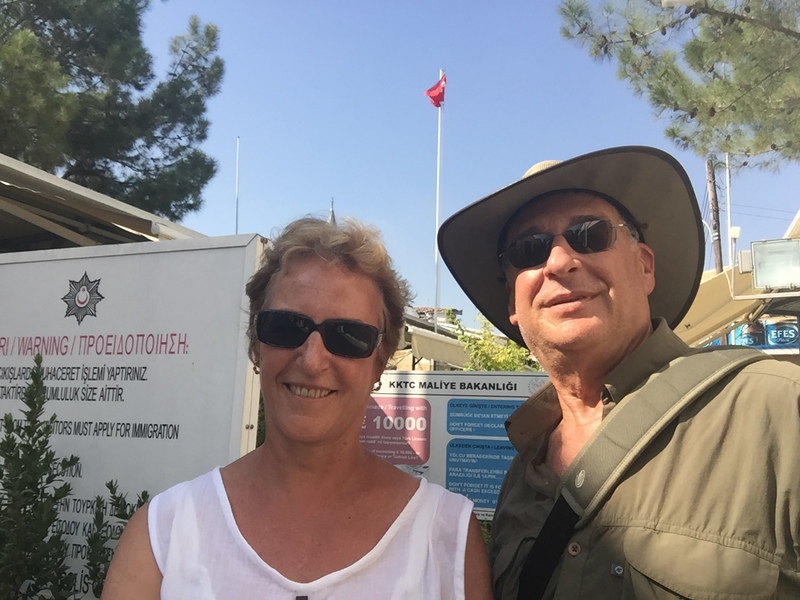 We walked into the neutral zone which is monitored by UN forces, but to get into the “occupied area”, Turkey, you need to show a passport. 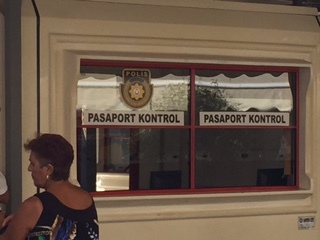 Even people living on the Greek side must show a passport to cross into that area. We visited the Old Town, enclosed by the 16th century Venetian walls and dotted with museums, ancient churches and medieval buildings. The Church of St. John was unlike any I have ever seen, every inch of walls and ceilings is covered with paintings depicting Christ and his life. 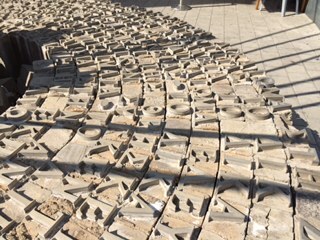 They do not allow you to take pictures, but there are a couple of sculptures outside that you could photograph. Here is the front of the church which looks so plain compared to what’s inside and one of the sculptures. One interesting thing we noticed is that all the buildings – not just some of them – the houses, hotels, businesses, etc, have solar panels and hot water tanks on the roofs. This is how they heat all of their hot water and it is mandatory. Tomorrow we have an early start and a very full day – arriving in Haifa and traveling to Jerusalem. We had a bit of a scare this morning, after breakfast, we had a note on our door that said our tour in Jerusalem had been canceled. We had signed up for an exclusive (only 10 – 16 people) because we wanted to see as much as we could without waiting for a lot of people on a tour. It has been 33 years since we visited here. Well, turns out we were the only people who signed up for that one, so we hurried down to get tickets for another tour. So now we are on the same tour but not the exclusive version. AND, there are only 16 on that one anyway! Looking forward to it, and then on Monday we have a half day still in Haifa when we will probably visit the Arab market, the Bahai temple and gardens. Stay tuned! 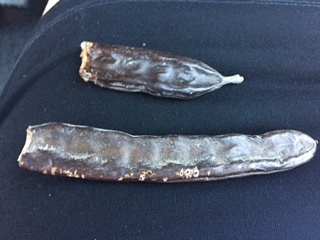 Bring me back some carob pods please!